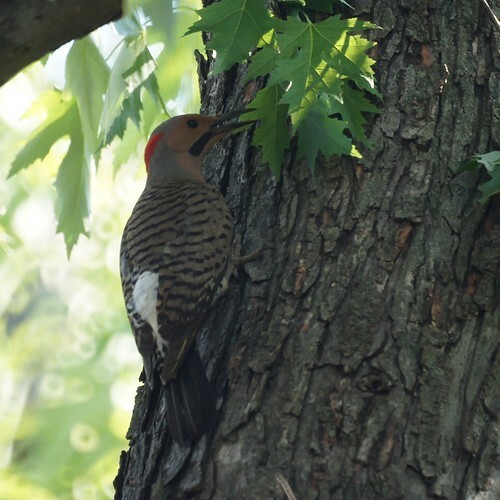 We first located the flicker nest on May 27 and got some pretty good photos. "Nest Placement: Cavity. 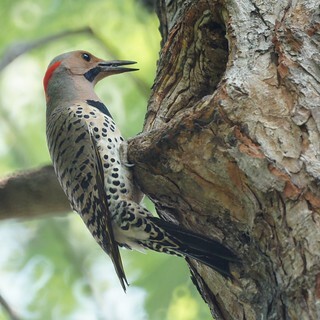 Northern Flickers usually excavate nest holes in dead or diseased tree trunks or large branches. Nest Description: Both sexes help with nest excavation. 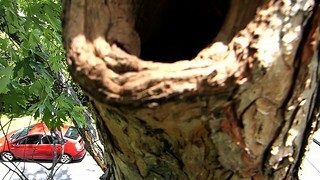 The entrance hole is about 3 inches in diameter, and the cavity is 13-16 inches deep. The cavity widens at bottom to make room for eggs and the incubating adult. Inside, the cavity is bare except for a bed of wood chips for the eggs and chicks to rest on. Once nestlings are about 17 days old, they begin clinging to the cavity wall rather than lying on the floor. Egg Laying: Shortly after the birds finish the cavity, the female begins egg-laying. She lays semi-glossy, pure white eggs early in the morning, adding one egg per day until there are five to eight eggs laid. As few as three eggs and as many as 12 have been reported in a clutch, but larger clutches usually represent eggs from two females. Clutches laid early in the breeding season tend to be larger than those laid later. Once egg laying begins, the birds never leave the nest unattended. Adults take turns remaining near or at the nest site. 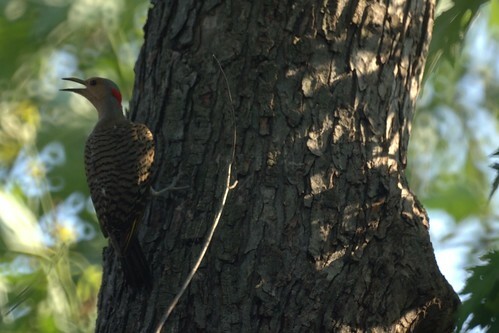 Incubation: The incubation period for Northern Flickers is 11 to 14 days, and incubation begins one to two days before the female lays the last egg. Both sexes incubate the eggs. The female is most attentive toward the nest during early incubation, but later the male is the more attentive of the pair and remains with the eggs at night. Nestling Care: The young hatch within one to two days of each other. The female broods the newly hatched young, but as the nestlings grow, female attentiveness decreases and male attentiveness increases. 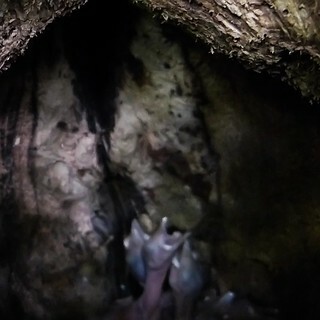 The male remains in the cavity with the nestlings at night. Shortly after hatching, the young can produce a unique buzzing sound, an ability that lasts until they are nearly full-feathered. The nestlings make the sound whenever something approaches the nest cavity and researchers speculate that the noise, which resembles an agitated swarm of bees, may frighten away squirrels and other nest predators. We've been waiting to see the baby flickers and watching daily. We've seen both the male and female at the nest. 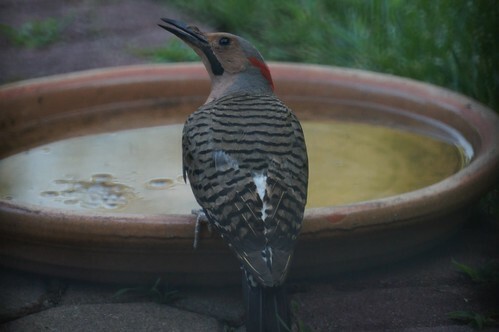 It got close to 100 degrees last week and the female flicker appeared to be panting while guarding the nest, so we put some water out front for them. The male has also been guarding the nest. We've been dying to know the status inside the Flicker nest. Mike has been suggesting contacting people with trucks with ladders and buckets, while Chris thought that was a little extreme. A regular ladder was considered, but the fear of injury put a stop to that idea. This morning while on our usual around the block walk, we ran into neighbors Lana and Carl, who also take a morning walk. They read the blog and asked about the Flicker nest and we told them we hadn't seen the babies yet. Mike inquired of their tools or access to trucks, and Carl said he had an extension pole that might reach the height we needed. Chris wanted nothing to do with this plan (what with the moving preparations and all), but boys will be boys, and off we went to borrow the extension pole. Later in the day when the light was right, Mike had the contraption configured with the tripod attached to Carl's pole with zip ties, and the smaller and lighter of our cameras on the tripod taking video. Although Chris vowed she would not get involved, she did offer some assistance with hoisting the thing up and catching the camera on the way down. It was barely tall enough, but Mike was on his tiptoes with the poles fully extended and we were able to capture some images of proof there is life in the nest! Chris was fussing to not keep the camera there too long to stress the babies or the parents, but in the end even she was happy to know what was in the nest 30 feet up. These babies will probably not fledge before we leave on Friday, but that's probably just at well as we would be fretting and worrying about their survival. Here are some photos of our adventure. Here is the same video from YouTube and Flickr of the nest. In the video, you can hear the buzzing of the babies as described at the websites above. It's best to watch in full screen mode because the babies aren't centered. So, what do our blog readers think? Will the birds miss us or be glad to see us go?